So this afternoon, I was entering my apartment building and struggling to carry my bike while opening the door. There was a guy behind me carrying about 11 books…. also not in a great position to hold the door open. He kindly held it anyways and we clumsily made it through the doorway. I cheekily asked him if he had enough books and he laughed and told me that he’s studying for the MCAT (medical school exam). As he was getting off the elevator, I asked if he was free at that moment and told him about my project. It was a literal “elevator pitch” and it was successful. He was free and very willing to come over and chat. His name is Fraser and he is my stranger of the day. I’m really glad he did come over. 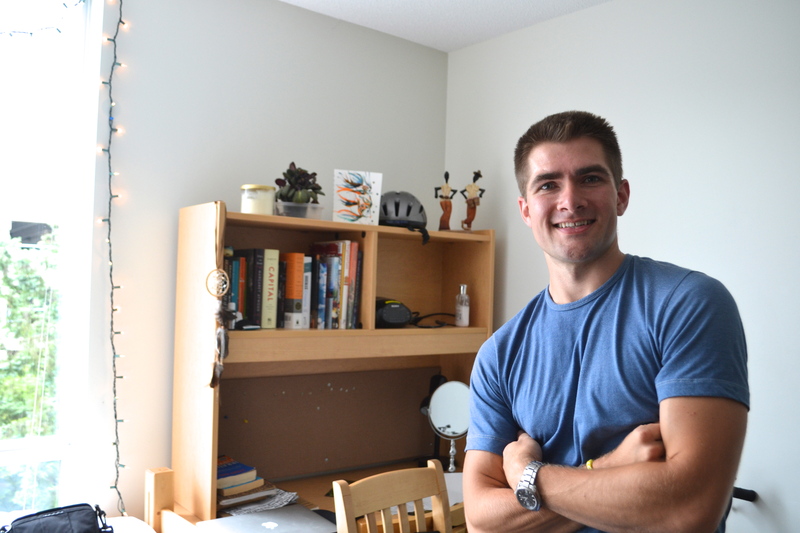 He’s studying honours pharmacology at UBC and is also studying, as you may have guessed, for the MCAT. He’s really interested in cancer research and is doing some work in a lab right now. Someone there recommended that he read a book called “The Emperor of All Maladies”. He just finished it, really enjoyed it, and recommended it to me. I could tell he was really excited about it by the way his face lit up. Seeing people passionate about what they do has always been very inspiring for me. His personal story is anything but average and far from uninteresting. Back when he was just 18 and in his first year of university, things didn’t go as planned. He was failing in school and stopped after just one year of it. Later, he worked in construction, got married, had a son, got divorced, and came back to school after that. He gets to see his son every now and then and even spent all four months of summer with him last year. He deeply cherishes the time they spend together. It was a good reminder for me that life doesn’t have to be a socially pre-determined linear process. We’re often socialized to live in a very particular way: go to elementary school, high school, university, university again, then university again because ‘apparently’ two degrees aren’t even enough, then get married, then have kids, then retire, then enjoy life. Hmm. When Fraser told me he was going into fourth year, I wrongly assumed that meant that he was on the aforementioned linear path and that he must be 21 years old. It was a refreshing reminder that the path isn’t always and shouldn’t always be linear. Then I asked him what changed. I mean, when he started off in school, he was failing his way through it. Now, he’s an honours student navigating his way through very challenging coursework and real life responsibilities. He told me that what’s different now is his level of motivation. He knows why he’s doing what he’s doing and feels propelled by that awareness to work hard and succeed.